Christine "Lady Bird" McPherson is a senior student at a Catholic high school in the suburbs of Sacramento, in 2002. She lives with her parents, with whom she has a strained relationship, her older brother, who is adopted, and his girlfriend. Lady Bird is best friends with Julianne "Julie" Steffans. Lady Bird and Julie join their school's theatre program, where Lady Bird meets a young man named Danny O'Neill. They develop a romantic relationship, leading to Lady Bird joining Danny's family for Thanksgiving dinner rather than doing so with her own family, much to her mother's disappointment. Their relationship is abruptly broken when Lady Bird finds Danny making out with a boy in a bathroom stall after the performance. At the behest of her mother, Lady Bird takes on a menial job at a coffee shop, where she meets an edgy musician named Kyle Scheible. 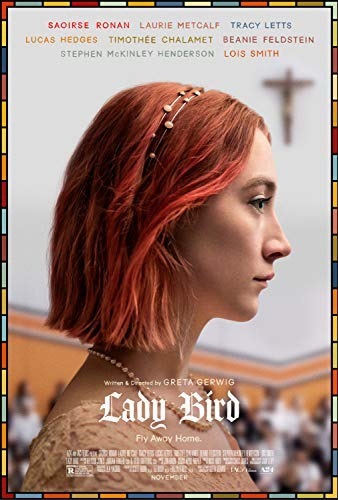 He and Lady Bird begin a romantic relationship, and she begins to drift away from Julie in favor of a friendship with a popular girl named Jenna Walton. Read more on Wikipedia.